A studio meeting of two superb brazilian musicians traveling in Argentina early 70’s. The percussionist, composer, inventor & singer Pedro Dos Santos or his well known nick name “Sorongo” recorded in 1968 the holy grail of brazilian music records, “Krishnanda” years ahead of his time. On this record he shows many of the instruments he invented, one of them is the “Tamba” that the famous Tamba Trio used not only as a name but central percussion sound that makes Tamba so special. It's not a coincidence that Helcio Milito Tamba Trio percussionist/drummer produced Krishnanda for his big influence Pedro Santos. 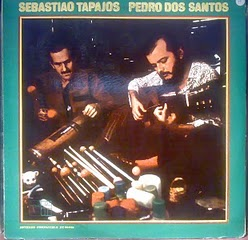 Acoustic guitar virtuoso Sebastião Tapajós recorded with several artists from Gerry Mulligan to Hermeto Pascoal & soundtracks for brazilian movies.